Josh Wilson '18 was featured in a City South (formerly St. Louis Park) Magazine article spotlighting outstanding students. 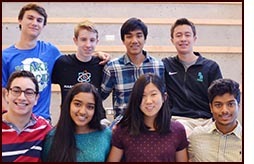 The following students earned semifinalist designation in the 2017 National Merit Scholarship Program (pictured, front row, l to r): Nicolas Barra, Sneha Sinha, Jessie Kang, Joel Jude (back row, l to r) Sean LeBlanc, William Pannell, Ravi Chepuri and Jack Barker. Seniors Nicolas Barra and Anabella Walser were selected as National Hispanic Scholars. Barra and Walser scored in the top 2.5 percent among Hispanic and Latino PSAT/NMSQT test takers in the region. Fourteen members of Blake's senior class were commended by the National Merit Scholarship Program for outstanding academic promise: Charlie Ankeny, Linus Bendel-Stenzel, Sarah Chute, Zach Dekko, Jack Fraley, Chris Gill, Zac Johnson, Hannah Jones, Emily Kranendonk, Matthew Martinez Sutton, Campbell Morrison, Aditya Shekhar, Logan Sudeith, Sarah Weinshel and Cole Woerner. Ben Lee '19 was named one of five National Student Poets in the United States. Blake Director of Global Programs Dion Crushshon '88 and Blake Interim Director of the Office of Equity and Community Engagement Marie Michael have each contributed a chapter to the book "The Guide for White Women Who Teach Black Boys." Facing issues of race and privilege with a clear, compassionate gaze, this book helps teachers illuminate blind spots, overcome unintentional bias and reach the students who need them the most. College Counseling liaison/essay coach Linda Barrows has her writing piece "Winter Eyes" included in the coffee-table book "Amazing Minnesota." Blake Upper School English teacher Mike Bazzett has released his latest book of poetry, "The Interrogation." Lower School Blake campus second grade teacher Kamie Page and her dad Alan Page have written their latest book, "Grandpa Alan's Sugar Shack." It's the third book they've written together and profits from the book support the Page Education Fund. Students from Will Bohrnsen's Environmental Science and Elizabeth Flinsch's Photography II classes collaborated with the Minnesota Pollution Control Agency to create informational artwork for the Minnesota State Fair Eco Experience building. The exhibit has been on display at the Mississippi Watershed Management Organization and will be at Dodge Nature Center from mid-December to mid-February. Toby '23 was awarded a blue ribbon at the Minnesota State Fair for a line art drawing created in Seexeng Lee's Middle School art class. Will Lyman '19 was featured in a Minneapolis St Paul Magazine story on experiences preparing students for college and beyond. Highcroft campus fourth graders Emily and Sophia were selected to play a cello duet in MacPhail's Fall Honors Recital that took place on Dec. 15 at MacPhail's Antonello Hall. They played "Concerto in G minor for Two Cellos" by Anonio Vivaldi. 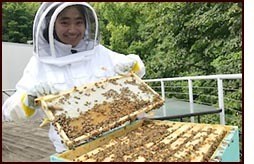 Niharika Bhavsar '20 received the Minnesota Hobby Beekeepers Association (MHBA) scholarship. The scholarship grants a one-year membership in the MHBA, tuition to a University of Minnesota beekeeping course and beekeeping equipment, including a package of bees. Bhavsar's mission is to increase the bee population by maintaining their delicate ecosystem. J.J. Kahle, Upper School Spanish teacher and GLBTQ support and advocacy, spoke at Hastings College's Hastings Oral History Initiative fall workshop. Kahle's story was featured in an NTV Good Morning Nebraska segment. Blake Director of Information Support Services David Boxer is one of 13 master educators and professional learning leaders selected to Global Online Academy's inaugural Learning Design Coaches Cohort. The fourth grade Blake campus class received a Watershed Hero "Young Naturalist Award" award from the Minnehaha Creek Watershed District. The award was presented at the MCWD's Sunset Celebration. Blake's fall athletics had a successful season. Team results can be found on the Blake Bears website. Derek Hitchner '18 was named Junior Boys' Player of the Year and ranked #10 in the men's category by the Minnesota Golf Association (MGA). Read more here. Hitchner earned three top-10 finishes this season, including a tie for fifth at the Minnesota State Open, a tie for sixth at the Western Junior, and a tie for fifth at the Minnesota State High School League Class AA Tournament. He qualified for the U.S. Amateur Championship in Los Angeles, Calif. and was named AJGA Rolex Junior All American. 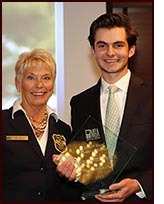 Pictured is MGA President Barb Hanson presenting Derek with his award. Photo by W.P. Ryan/Courtesy MGA. Beth Calderone, Upper School social studies teacher, was inducted into the University of Chicago 2017 Athletics Hall of Fame. Seniors Abbie Nelson and Pia Phillips were featured in a Star Tribune article about the nonprofit they co-founded, Pab's Packs. Blake celebrated its 12th annual Legacy Day. 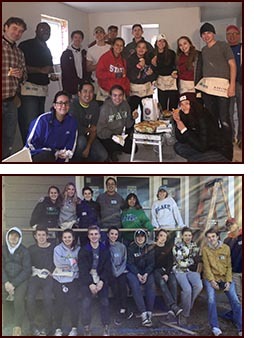 Students, volunteers and staff built 68 storage boxes for Twin Cities Habitat for Humanity, wrote 393 cards for Pab's Packs, packed 6,000 meals for Matter, built 60 dressers for Bridging and created 600 watercolor cards for seniors. Read more and see photos from the day. 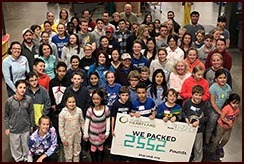 The Upper School DECA student business club invited members of the Blake community to join them at Second Harvest Heartland the day before Thanksgiving. The 80 volunteers packed 2,552 pounds of pinto beans for food shelves in Minnesota and Wisconsin. 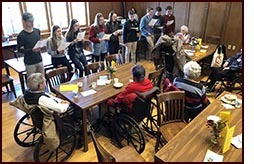 The Upper School Community Service Board (CSB) hosted a lunch for residents of Jones-Harrison, a senior living community in Minneapolis. The event included a visit to the Bennett Gallery for a look at the Water: Blake and Beyond art exhibit; AP French students shared a song and talked with seniors about their global issues projects. CSB students also visited GiGi's Playhouse, a center for individuals with Down syndrome in St. Louis Park. Upper School students and Blake faculty and staff volunteers gathered in Saint Paul in November and north Minneapolis in December to work on homes for Habitat for Humanity. To submit an item for the spring edition of Applause, email communications@blakeschool.org.